We all know that we need exercise, and many of us have lifestyles that do not lend themselves to movement. A good exercise chaise lounge, a yoga chair or an exercise ball, or perhaps even all three, can promote stretching and engaging in exercise routines. 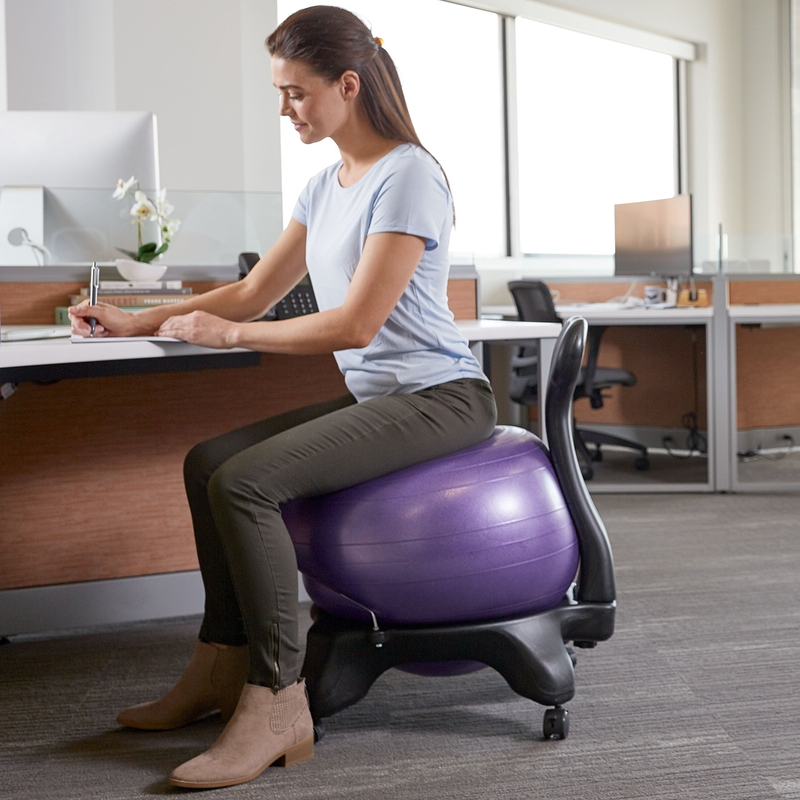 If you’ve always wanted to try a balance ball chair but were worried about being able to “balance” on one, then this chair is the perfect choice for you. The ball is settled into a wheeled framework and clamped by a low back support. You gain the benefits of being seated on a ball without the hazards of tumbling off it. You gain the benefits of being more wakeful, more energized and more focused without being distracted by practicing the simple skill of sitting on a ball without falling off it. The ball can be removed and used for normal yoga ball exercises. The instructions recommend inflating the ball inside the frame and then letting it set for 24 hours for the fabric to fully stretch, to deflate it 50% and to then inflate it to the recommended height. The chair comes with an exercise book to give you ideas for ways to stay active. It is difficult to stay focused in meditation or on your laptop when you are seated on the floor and it feels as if your hip bones are driving through the floor. This buckwheat filled meditation pillow can help with this problem. The cover is quilted in beautiful cloud shapes to reinforce the peace you are attempting to achieve. The buckwheat filling can be discarded and refilled so that you always have a fresh, nice-smelling place to sit. When filled, the pillow weighs about four pounds, making a sturdy foundation for your meditation practice or for other activities that you might undertake while sitting on the floor. Correct spinal alignment is, if you will pardon the pun, the backbone of yoga practice. When the spine is properly aligned, the organs and the head fall into place. Circulation and breath are improved, and with them everything else is also made better, including overall health. It isn’t a miracle cure, but it does allow your body to work for you instead of against you. While sitting on the floor is generally deemed healthy, there are times when it is not. If the floor or ground area is damp, dusty, drafty or cold it will not be a pleasant place to sit and meditate. The woven seagrass meditation chair raises you just enough off the floor not to share local conditions. The chair is, as stated, made of seagrass that has been cured and woven using rattan weaving patterns. The wide seat provides enough space for a small to medium sized person to sit cross-legged on the cushion. Larger people might want to remove the back cushion or even cross their legs on the ground in front of the chair. Users reported various degrees of satisfaction, and the feedback from one user – that multiple plastic washers had been tacked to the bottom of one chair – indicates that quality of product might be variable. The cushions are covered with washable cotton, so your meditation chair can always be fresh and clean. Although it is sometimes referred to as a Tantric Yoga lounge, this bonded leather chaise lounge can also facilitate your solitary yoga practice. Curved so as to stretch the curvature of the back, it can support your frame as you engage in working on your core strength. It is also the perfect place to relax and stretch your body after working long hours at a desk or even after physical labor. Most seating arrangements encourage your body to bend forward, crunching the internal organs and bowing the back. This encourages you to relax in a position that straightens the spine and opens the skeletal structure so as to give maximum space to internal organs. Yoga is well-designed to encourage flexibility and correct posture while building strength through a series of repeated isometric exercises. It also invites mental exercise for no matter how much you know about yoga, there is always more to learn. There are many benefits to sitting on the floor, but for westerners who are used to sitting in a chair with a back support, lack of back support is one of the greatest challenges to learning to sit on the floor. The Back Jack floor chair is a pad attached to an upright back. Some assembly is required upon receipt of the chair, and it does not fold. The units are stackable, so if they are being procured for a class they can easily be set aside without taking up a lot of room. If added cushioning or support for extended legs is desired, the unit can be placed on a yoga mat. Sitting on the floor improves joint health and general flexibility. Using a backrest can help you transition from always sitting in a chair to being able to sit on the floor. If you have difficulty getting up and down, position a kitchen chair, stool or bench nearby to use for assistance. Here it is, the real exercise ball with no training wheels, so to speak. Sitting on an exercise ball helps work your body core even when you are sitting at a desk, typing. It can make your day go more smoothly for you to sit on this ball because it helps keep your mind stimulated and focused. It can be used as a substitute for a medicine ball, yoga exercise ball, or a pregnancy birthing ball. It has extra thick carrying handles and an air pump is included. There is an inner and outer chamber to be inflated, and some effort might be required to get it completely set up. It uses a standard bike pump set up for inflation. It promotes healthy joints for a healthy lifestyle and can be used for any yoga or other exercise routine that requires a ball. The canvas exterior is a soft suede. The Yoga chaise lounge is an excellent place to relax, stretch, and work on core muscle yoga exercises. The body is made from polyurethane foam and is covered with microfiber velvet for both support and comfort. The weight capacity is 400 pounds, no assembly required. The lounge’s narrow build makes it easy to extract oneself from upside down or stretching poses. It also makes it easy to straddle the lounge. These lounges are sometimes sold as tantric yoga furniture, but are completely functional for a standard yoga workout, especially for the poses that are designed to invert the frame and to stretch the spine. Not only can it be used as exercise equipment but it is also a place to simply relax, watch television or read. The narrow dimensions make it a good choice for a Tiny House or small apartment. It comes with a one-year parts warranty. The cover is washable, so no matter how much you perspire during a workout, your chair can always smell clean and fresh. The leather chaise lounge with legs is an excellent choice for the discerning city dweller who has a small apartment or bed/sitting room. The gentle curve of the leather-clad body invites lounging and relaxing as well as engaging in a yoga workout. Perfect for those rainy days when a trip to the gym or jogging in the park would be unpleasant. Its narrow width makes it easy to fit into a small living space, and its ability to multitask as a chair or couch or exercise equipment cuts down on the number of things that you need to cram into a small space. You can even invite your significant other over for a tantric workout if it suits your fancy, but the chaise lounge is perfectly suited to a solitary yoga workout at any time. The small legs on the bottom of the lounge make it easy to clean beneath it and keep the body of the lounge from contacting the floor where it might collect grime. That is not to say that you are a poor housekeeper, it is simply the nature of furniture that sits directly on the floor. If you like exercise balls, you will love this one. Covered with faux spotted fur, it comes with a low stand to hold it in place in your rooms. The stand is sufficiently sturdy, that you can sit on the ball while it is in it. However, it can be removed from the stand and used just like any other exercise ball. The soft fur is exceptionally comfortable to sit on, and the white background and dark spots are perfect with country or hunting lodge décor. It can be used as an accent, a desk chair or part of your exercise equipment. Like all exercise balls, it can help strengthen your core muscles, contributes to your flexibility and is perfect for yoga and other exercise routines that call for a large ball. Unlike other exercise balls, this one is likely to be a real conversation stopper and difficult to ignore as background. An exercise chaise lounge can be used for solitary yoga practice, or it can be used as part of a couple’s tantric yoga practice. The yoga chaise lounge is narrow, enabling the user to straddle it. Yet it is wide enough to offer comfortable support for one adult body width. The curves encourage correct posture and stretching. It can be used with yoga poses that involve being inverted, such as the Bridge, or the Fish pose. It can also simply be a nicely curved surface for relaxing, reading a book, or sleeping. Thanks to its narrow width, it is easier to fit into place where an ordinary couch or exercise bench might be difficult to place. The best part is that it can turn a resting pose into an exercise that stretches and strengthens the core muscles. There are times when you really need to be able to sit on the floor or at floor level. Unfortunately, a lifetime of sitting on chairs does not provide the average westerner with the right muscle groups to sit comfortably on the floor. A yoga chair provides back support and a little lift. A floor backrest often adds a cushion and back support. One big difference between the two is that the floor backrest can also be used on bleachers or other uncomfortable seating that does not supply a backrest. The yoga chair is often a wide-based seat that lifts you slightly off the floor, which can be a blessing in areas that are drafty, dusty or damp. A yoga pillow does not usually have legs, nor does it have a backrest. It does, however, insulate your backside from cold floors and provides a little protection for your hipbones. This can help you maintain your focus during a meditation session. It can also provide support for some of the seated yoga positions. Using exercise balls as desk chairs has become a fashionable choice. However, not everyone is successful at balancing on a ball, and not all exercise balls come in the same height. If you want to sit on a plain exercise ball, check the dimensions first and make sure they are the right height for you. For less intrepid explorers into this realm of seating, a frame that will hold the ball steady and not let it roll away is an asset. If that frame has lockable wheels on it and a back, you are truly moving uptown, so to speak, with this type of seating.